Pressure washer Elk Grove CA: Araya Clean Property Services provides excellent pressure washing Elk Grove CA. We serve customers 24/7 on their schedules with our exclusive, EPA compliant systems. You might be surprised how much a clean, well-scrubbed appearance can improve your bottom line. Araya Clean offers fantastic pressure washing services. Notice how much cleaner that grey cement area looks. And when the pressure’s on, no one beats the performance of this pressure washer Elk Grove CA. Araya Clean excels at flat and vertical exteriors. No matter what you need in pressure washing in Elk Grove CA, Araya Clean can do it. This pressure washer Elk Grove CA service performs pressure washing, power washing, graffiti removal, exterior paint preparation, striping removal, concrete cleaning, exterior building cleaning and water reclamation. We’ll leave your facility with a bright, sparkling exterior that attracts business. Customers like to patronize the kind of sparkling-clean buildings Araya Clean creates. And a clean and safe exterior says a lot about your company. We work according to your schedule. We’re available 24/7 during hours that don’t impact your business or customer flow. Our exclusive industrial-grade pressure washing systems combine heat, variable pressure, non-toxic cleansers and EPA compliant reclamation and recycling systems. Araya Clean is recognized as a Stormwater Compliant Pressure Washer and certified as a Sacramento Area Sustainable Business. Our rates are reasonable, our service is outstanding. To contact Araya Clean, call 916-236-4095. When the pressure’s on, no one beats this pressure washer Elk Grove CA. Araya Clean Property Services is your solution for effectively cleaning and maintaining the value of your property. Customers form perceptions based on appearances. A dirty entrance, walkway, service area or exterior sends a message of poor quality, indifferent service and potentially unsafe surroundings. Make a positive first impression with regular professional cleaning from Araya Clean Property Services. We combine power, heat and processes to deliver a superior level of clean to your property that will impress you and your customers. Araya Clean is proud to provide pressure washing services that are compliant with the local, federal and EPA guidelines. Our combination of biodegradable cleaning agents and water reclamation process are efficient, effective and environmentally responsible. Make your business look nicer, and select the place that will help you avoid fines that could be as much as $50,000. Editor's note: The following story is a corrected version of an article that ran Dec. 20. The Elk Grove City Council on Dec. 11 approved spending $20,000 on a cooperative agreement with the state Department of Transportation to study a proposed interchange at Whitelock Parkway and Highway 99. Elk Grove officials said the interchange would not be built for at least five years. City staff is required to prepare the environmental documents. This is a process that is planned to start next year. The $20,000 will go toward Caltrans to provide oversight work in developing and approving the city’s project study report, city spokesperson Christine Brainerd said. The scope of the work for the report will include studying the interchange, a bike and pedestrian crossing over Highway 99, alignment options for East and West Stockton boulevards, and widening Whitelock Parkway. Richard Shepard, the city’s public works director, said the council’s action does not authorize construction. “Assuming we have all of the money to build it and there are no other obstacles through the process to do the environmental document, the proper planning, and the construction, it would be a Herculean effort to be under construction in five years,” he said. Shepard added that there is no available funding to build the interchange. He said funding will come through developer fees, so there needs to be more development in that area before any construction takes place. Shepard said the interchange would likely be built in seven to 10 years but added that many interchanges take two decades to build. Many residents spoke against funding a study for an interchange that won’t be built for several years. They also said nearby Elk Grove Regional Park needs to remain intact. Karen Lopez, an Elk Grove resident for 28 years, said the regional park’s features including a dog park, a bike park, and the historic hotel would feel the impact of a highway interchange. Shepard said the plan is to minimize the impact on the park. He said some of the initial designs have no effect on the park. The city’s fiscal year 2013-18 Capital Improvement Program that council members approved earlier this year allocated $1.3 million for the study report. Council members also approved a request for $375,000 for the city to complete the existing scope of work for the Southeast Policy Area. The 1,200 acres are located between Whitelock Parkway, Highway 99, Kammerer Road, and Bruceville Road. The funding, which will be pulled from general fund reserves, is in addition to the $650,000 previously allocated to the project. Christmas from years past . . .
Elk Grove, the large Sacramento suburb often viewed as a bedroom community, is hoping to overcome its sleepy image with a focus on large events to attract new visitors and a sleek website costing $45,000 to promote tourism in the city. “We’re trying to address the conception that there are only rooftops and big-box stores in Elk Grove,” said city spokeswoman Christine Brainerd, head of the new tourism campaign. City leaders envision a civic center, children’s museum and soccer stadium as future attractions. They also see potential for an outlet mall and splashy water park. But in a landscape dominated by tract homes, neighborhood parks and suburban retail, the city for now is promoting Old Town Elk Grove and events like a monthly food-truck festival to draw visitors. The city has hired an events coordinator, Kristyn Nelson, who has begun organizing a new Fitness Festival for May that plays off National Bike Month. Mayor Gary Davis compared the city’s festival strategy to that of Gilroy, a rural farming town of 50,000 in southern Santa Clara County. The city recently launched a website aimed at promoting tourism, InElkGrove.com, which highlights places to shop, dine and play. With the headline “Picture yourself in Elk Grove California,” the site displays images of colorful sushi and beautiful parks. Davis has resolved to create jobs, citing what he calls the worst job-housing imbalance in the region – fewer than 30,000 jobs for 159,000 residents. “It’s part of a broader plan to promote job growth in our community. Our goal is to grow jobs by the thousands, not by the dozens,” he said. The mayor declined to offer specific figures on job creation from tourism, saying that it was “too early.” The city does not track the number of tourists who visit or how much they contribute to the local economy. A year ago, the city purchased a five-acre parcel of land along the railroad in Old Town and is exploring ways to develop it, said Randy Starbuck, economic development manager. The space is now the site of a monthly food-truck festival. So far, the city has spent tens of thousands of dollars on the tourism campaign, including $45,000 for the website and $6,000 to produce a video, according to Brainerd. In addition, it has allocated $2,000 for online advertising. The city may face an uphill battle in attracting visitors. Out of 10 people interviewed by The Sacramento Bee during the monthly food-truck fair this month, all were Elk Grove residents except for a visitor from nearby Wilton. The residents said they enjoy living in Elk Grove, but they were skeptical that it could become a tourist destination. John Lowry, longtime owner of Lowry Music and Antiques in Old Town, questioned whether the effort is worthwhile. “If I was a tourist, I wouldn’t know what to do in Elk Grove,” he said, noting that the tourism programs have not helped his business. The city’s initiatives have not always been successful. An ice rink funded by taxpayers last winter operated at a huge loss. The rink cost just under $134,000 to operate, but generated only $57,380 in revenue. It will not return this year. That’s precisely why the city is rolling out the campaign now, officials say. “We’re putting our best foot forward so we have a solid foundation to build upon over the next decade,” Brainerd said. Pressure Washer Elk Grove CA Announces Graffiti Removal Service. Araya Clean is an eco-friendly pressure washer Elk Grove CA. Unsightly graffiti can go a long way in turning off customers. But this pressure washer in Elk Grove CA, says it can help businesses attract customers. Details are available at: http://www.pressurewasherelkgroveca.com. It’s no secret that people like to patronize clean, attractive-looking buildings. And officials at Araya Clean say a well-kept exterior can go a long way in actually improving customer traffic. This pressure washer service provider in Elk Grove CA improves the appearance of flat and vertical exteriors and general surfaces. They specialize in removing no only graffiti, but stains and dirt, leaving a bright, clean appearance. And, according to company officials, Araya Clean of Elk Grove CA is a green, eco-friendly pressure washer Elk Grove CA. Being a “green” pressure washer means acting in an eco-friendly manner right from the very start, they say. Officials said a conscientious pressure washer should pre-clean outdoor areas by sweeping and using dry spot cleaning methods to clean before power washing. An eco-friendly pressure washer Elk Grove CA also must use only water, or “eco-friendly” cleaners that are less toxic, and less harmful to the surrounding environment. Customers should be given assurance that the pressure washer they contract with is following these eco-friendly measures. It is important to give them some sort of certification that specifies the pressure washing company’s processes in properly managing wastewater during the process and disposing of it once the job is done. So, for a cleaner, brighter, more customer-friendly exterior, call the eco-friendly pressure washer Elk Grove CA. More information on Araya Clean and its eco-friendly pressure washing Elk Grove CA is available by calling 916-236-4095, or by visiting www.pressurewasherelkgroveca.com. Pressure washer Elk Grove CA service company claims that shoppers prefer clean, well-scrubbed facilities. Araya Clean pressure washes large jobs. (EMAILWIRE.COM, May 03, 2013 ) Elk Grove, CA -- Large regional shopping centers have their own specialized cleaning requirements, if they want to attract large numbers of shoppers. With a large shopping center, the needs start with the entryway, according to Araya Clean. They say customers’ first impressions are formed there, and a filthy, grimy entrance can leave a permanent mark. This pressure washer Elk Grove CA service company helps keep businesses looking fresh and new by steam-cleaning and pressure washing away tough stains and grime that build up over time. Highly trained technicians steam clean entries to remove the gum, grease, oil, and other substances that typically occur outside the door. They then pressure wash the rest of the area, from parking lots and sidewalks to benches and awnings – leaving the grounds sparkling clean. And keeping tenants happy along with their customers. Officials are quick to warn, though, it’s important for an owner or manager to make certain their pressure washer Elk Grove CA is professional from start to finish. And that means being eco-friendly. In some cases, they say, fines can total up to $50,000 a day for not following proper procedures for recycling or disposing of run-off water. Araya Clean’s five-stage recycling process reclaims and reuses all run-off water. Their entire process complies with the EPA Clean Water Act and all local regulations -protecting managers of large projects from possible penalties. Being a “green” pressure washer means acting in an eco-friendly pressure washer from the very beginning, they say. Officials said a conscientious pressure washer should pre-clean outdoor areas by sweeping and using dry spot cleaning methods to clean before power washing. A green pressure washer Elk Grove CA also must agree to use only water, or only “eco-friendly” cleaners that are less toxic, and less harmful to the surrounding environment. And while Araya Clean is equipped for cleaning huge office complexes and retail shopping areas, officials say the pressure washer Elk Grove CA performs jobs both big and small. More information on Araya Clean and its eco-friendly pressure washing Elk Grove CA is available by calling 916-236-4095, or visitingwww.pressurewasherelkgroveca.com/p/commercial.html. About Araya Clean: Araya Clean Property Services is a professional pressure washer that specializes in pressure washing, power washing, graffiti removal, exterior paint preparation, striping removal, concrete cleaning, exterior building cleaning and water reclaim/reclamation. The company is recognized as a Stormwater Compliant Pressure Washer and certified as a Sacramento Area Sustainable Business. They are registered to do business with the federal government and are a Certified Small Business with the state of California, Sacramento County and the city of Sacramento through the Department of General Services. Besides Elk Grove and Sacramento, Araya Clean services nearby Stockton, Fairfield and Citrus Heights. Araya Clean is an eco-friendly pressure washer Elk Grove CA and shared eco-friendly advice. Pressure washing the walls can make businesses look much brighter and more inviting to customers. (EMAILWIRE.COM, December 18, 2012 ) Elk Grove, CA - It’s one thing to be an effective pressure washer Elk Grove CA, it’s quite another to be eco-friendly. According to company officials, Araya Clean of Elk Grove CA is both. Being a “green” pressure washer means acting in an eco-friendly manner right from the very start, they say. Officials said a conscientious pressure washer should pre-cleans outdoor areas by sweeping and using dry spot cleaning methods to clean before power washing. 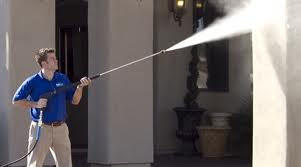 It is also important for a company wanting to stay environmentally friendly to periodically assess the materials and processes it uses in pressure washing Elk Grove CA. Such an assessment ensures compliancy with local Stormwater Ordinances. More information on Araya Clean and its eco-friendly pressure washing Elk Grove CA is available by calling 916-236-4095, or visiting www.pressurewasherelkgroveca.com. About Araya Clean: Araya Clean Property Services is a professional pressure washer that specializes in pressure washing, power washing, graffiti removal, exterior paint preparation, striping removal, concrete cleaning, exterior building cleaning and water reclaim/reclamation. The company is recognized as a Stormwater Compliant Pressure Washer and certified as a Sacramento Area Sustainable Business. They are registered to do business with the federal government and are a Certified Small Business with the state of California, Sacramento County and the city of Sacramento through the Department of General Services. Surface cleaning is an important part of our job. Araya Clean proudly provides pressure washing service throughout the Sacramento, Yolo and Placer County areas, including: Sacramento, Elk Grove, West Sacramento, Natomas, Rancho Cordova, Citrus Heights, Fair Oaks, Carmichael, Folsom, Roseville, Davis, Galt, Lodi California.